Newcastle boss Steve McClaren expressed his "frustration" at only beating West Bromwich Albion by a 1-0 margin in the Premier League on Saturday. Despite dominating possession and having more shots than in their last two games combined, the Magpies were unable to extend their early lead. 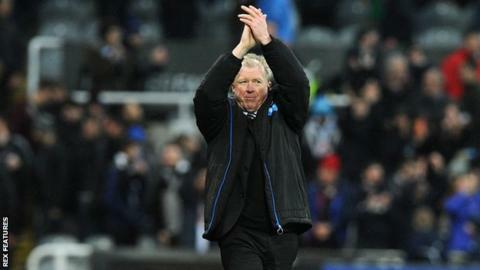 "You do worry when you've had so many chances," McClaren told BBC Newcastle. "A couple of balls flashed through our box and I thought 'this would be cruel'. We hung on and deservedly so." Newcastle have the fifth worst goalscoring record in the division, with only 26 goals in 25 games, but McClaren has been encouraged by the chances his side are creating. He continued: "We've progressed and we've come on. We weren't even getting shots on target early in the season. "It's still a frustration - we really looked a good team going forward without getting the end product of more goals." The win moved Newcastle out of the relegation zone, one point clear of 18th-placed Norwich, while the Magpies ended a run of nine Premier League games without a clean sheet. "This is the football we need to play, not just in front of our fans but we need to play football like this away," said goalscorer Aleksandr Mitrovic. "It's a big, big three points but still we have 13 more finals - we need to play like this every week."